On first sight even American Pitbull puppies are formidable creatures, appearing full of passion and power – with an undying desire to please. 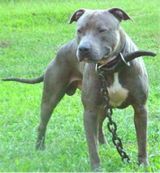 Muscular and stocky, yet extremely agile, the American Pit Bull Terrier traditionally had clipped ears and a docked tail, however this practice is now illegal in many countries. The characteristics of American Pitbull dogs have provoked extreme reactions in people over the years, but they are by no means 'people haters' or even 'people eaters'! American Pitbull puppies have a natural aggression toward other dogs, not people. However, if properly trained, socialised and managed from an early age, this aggression will not be seen. American Pit bull puppies, can be a funny, affectionate and extremely loyal family pet. Highly protective of its owners, and property, American Pitbull dogs will fight an enemy to the death. American Pitbull puppies seem to have an uncanny instinct to know when to protect and when everything is okay. However, they can be a wilful breed and need a firm hand. In general American Pitbull puppies are very friendly, but are not recommended for most people – due to the strong training and general management regime required to ensure they are good family pets. Originally bred as fighting dogs, the American Pitbull dogs may attack the throat of a strange dog. The continued promotion of the fighting instinct amongst less credible breeders, continues to give the American Pitbull puppies a bad name. Early, consistent and extremely thorough training and socialising required from an early age. Specialist training groups are recommended.